No. 5, Jalan TS 6/4, Taman Industri Subang, 47510 Subang Jaya, Selangor, Malaysia. 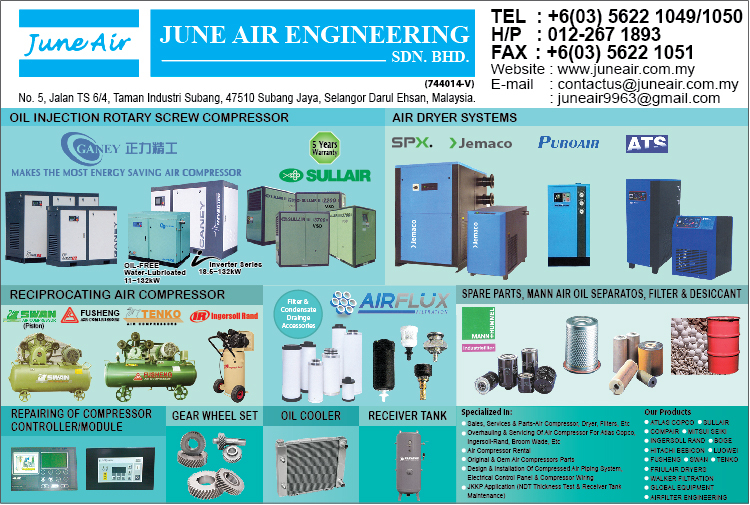 June Air Engineering Sdn. Bhd. was formed and incorporated by a group of well-trained Air Compressor System professionals who have been in the Air Compressor Sales & After Sales Service business for more than 20 years. 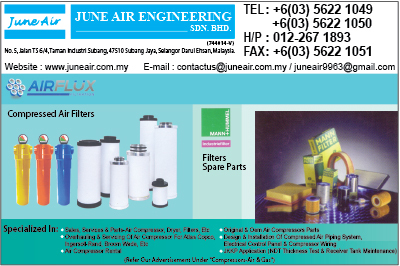 It is a dynamic engineering company specializing in compressed air technology. Our objective is to meet and exceed the demand of our clients by providing quality products and services at the right prices. With our well-trained and experience sales and service team, we are capable of trouble-shoot, perform field repair and major overhaul on most major brands of industrial air compressors. In addition, we are able to save you valuable production time with our well-stocked inventory, well-equipped workshop and air compressor rental programmed. 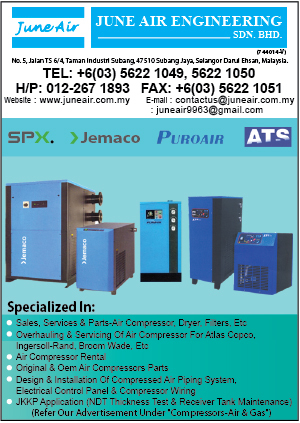 Beside air compressor servicing and installation, we are also the authorized dealer for Sullair and MitsuiSeiki Air Compressors. Whether you are building a new factory or expanding your current facilities, this compressed air equipment will be your best choice in term of money and performance.